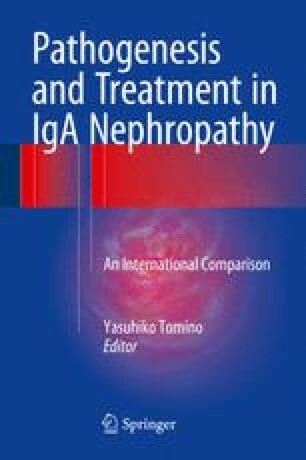 There have been several lines of evidences for familial aggregation of IgA nephropathy (IgAN), as well as mesangial deposition of IgA, suggesting that the susceptibility to this disease is genetically controlled. In our institute, family histories of hematuria, end-stage kidney disease, and glomerulonephritis are observed in about 10 % of cases with IgAN, even in those without any significant hereditary nephritis or kidney diseases. Recent large-scale genome-wide association studies (GWAS) of sporadic IgAN have identified multiple susceptibility loci, providing an insight into the genetic architecture of this disease, although each of their individual impact to the development of the disease is still not enough. It has been recognized that most of these loci are either directly associated with risk of inflammatory bowel disease (IBD) or maintenance of the intestinal epithelial barrier and response to mucosal pathogens. Further elucidation of the role of genetic variants underlying IgAN, and hologenetic views of gene variants and environmental factors, would be necessary to understand the precise pathogenic mechanism of IgAN in more detail. This work was partly supported by Grant-in-Aid for Scientific Research (B) to I. Narita and (C) to S. Goto from the Japan Society for the Promotion of Science and also by MEXT KAKENHI (221S0002).